Unlike the proverbial cat, one may expect the Premier Mine to enjoy only four lives. The first lasted from the discovery of the diamond pipe just before 1902 - and the formation of the Premier (Transvaal) Diamond Mining Company - until the outbreak of World War I when the mine was shut down and operated on a caretaker basis. By January of 1916 it was working again and production continued up to 1932 when mining operations ceased due to the depressed state of the diamond industry. Working resumed in 1945, but its fourth life really began in 1979 with the opening up of the mine below the 'Gabbro' sill, a 70-meter geologic intrusion of barren rock which cuts right through the pipe some 400 meters below the surface. Production from this new source has not only given the mine its longest life, but one that should enable production to continue for another fifteen years. In the early years of its existence, the Premier Mine produced many large diamonds, including, of course the Cullinan in 1905, and since working was restarded in 1945 the mine has continued to yield some exceptional stones. One of the most exciting moments early on the morning of Sunday, May 22nd, 1954, when a diamond measuring just under 51 mm long, just over 25 mm wide and 19 mm thick unexpectedly appeared on the grease tables at the recovery plant. It was immediately apparent to the officials present that this was an exceptional find. The diamond weighed 426.5 carats, was internally flawless, but was slightly chipped, probably due to contact with the mine's underground crusher. Sir Ernest Oppenheimer considered that it possessed the most perfect color of any diamond he had seen, an opinion shared by others who were fortunate enough to view it. In due course the unnamed diamond was shipped to London and in February of 1956 it was announced by the Diamond Trading Company that a sale of rough diamonds totalling £3,000,000 had been made to the firm of Harry Winston Inc. of New York. At the time this transaction represented the largest single sale ever made to one of its clients. On February 1st, 1956 the diamond was brought from Ildewild Airport by a messenger for a customs broker and duly delivered to its purchaser in a brown paper bag. Accompanying him and, like him, unattended by any special guard, was a postman with three cardboard boxes containing the rest of the diamonds under his arm. The shipment had been made to New York by registered post and the actual postal charges ammounted to the princely sum of about £1.75. Harry Winston and his cutting staff spent weeks debating whether to fasion one large gem or several smaller stones from the rough. In the end they decided on a single diamond, Mr. Winston stating that while it would have proved easier to sell the smaller stones, he felt that the historical value of creating one fine gem was more important. Once this had been determined, plans were laid to ensure the cutting of a perfect final gem. The cutters made more than three hundred lead models of the proposed finished gem to guide them in their task. The actual operation was performed by Winston's chief cleaver, Bernard de Haan, who spent the entire year working on the project. 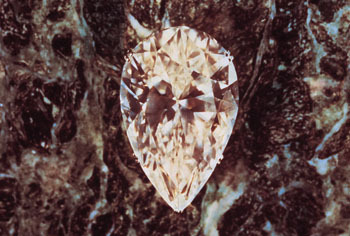 The first severance took five weeks: from the 70-carat piece removed, a 27.62-carat marquise was later polished. The second took equally long and produced another 70 carats from which a very significant emerald cut of 39.99 carats was obtained. Thus a rough piece weighing about 270 carats remained. For some 58 days, master diamond cutter Bernard de Haan first ground then polished the great gem. Ultimately it yielded a pear shape weighing 128.25 carats, possessing 58 facets, plus 86 facets around the girdle, totalling 144. On February 27th, 1957, the 'Ice Queen', as de Haan had nicknamed it, was unveiled to the world. 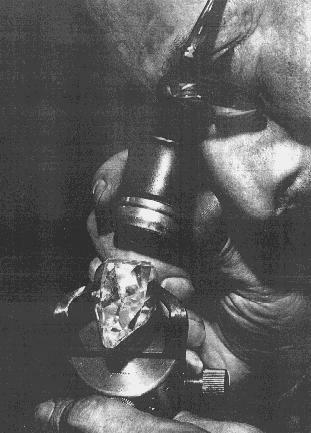 The April, 1958 edition of National Geographic magazine featured an article on diamonds, in which the Niarchos' cutting process was shown. National Geographic. You can already see the pear shape of the stone beginning to appear. The caption under the above photo read: "Winston's Chief Cutter, Bernard de Haan, Studies His Ice Queen." Son, grandson and great-grandson of Amsterdam diamond cutters, Mr. de Haan met his greatest challenge in New York while fashioning the Niarchos. "I called it the Ice Queen," he says, "because the rough stone would have been hard to spot in a bucket of ice cubes." Soon after, the late Stavros Niarchos, the Greek shipping magnate, bought the gem for his then wife, formerly Charlotte Ford, for a reported $2,000,000. Members of the Ford family were not polite, refering to the diamond as 'the Skating Rink', but Niarchos remained unperturbed, having also bought the two other gems that had been fashioned from the original 426-carat rough. For that amount - and after they were divorced - he was surely entitled to bestow his name upon the diamond which he generously lent to many exhibitions. In 1966 the Niarchos returned to South Africa for the famous centennial 'Jewel Box 1966' exhibition. Since his death in April of 1996, no further information about the Niarchos Diamond has been forthcoming. However, the 39.99-carat emerald cut, known today as the Ice Queen, was auctioned by Sotheby's of New York in October of 1991. Having earlier been graded by the Gemological Institute of America as D-color and VVS1 clarity, it was sold for $1,870,000 to Sheik Ahmed Hassan Fitaihi. Sources: Famous Diamonds by Ian Balfour, Diamonds - Famous, Notable and Unique by GIA, and National Geographic magazine.